Astronomy to Optics | History of Science | Rare Book Auction | Skinner Inc. I got a phone call last August about a potential book collection. Nothing unusual there, my job allows me the privilege of responding to queries about book collections every day. The description of the collection was brief but promising: about 125 books on the history of science, from the sixteenth to nineteenth century. I had a few days to ponder the possibilities. I am painfully optimistic, but I tried to temper my enthusiastic imagination. Even the spare description provided enough material for me to concoct a fine imaginary collection. The scientific method was invented in the seventeenth century; all of our modern scientific instruments were in their infancy in this period. In England, Robert Hooke scrutinized minute bodies under his microscope, while Galileo observed the features of the moon for the first time through the telescope. Astronomical observers like Tycho Brahe steadily contributed their data to the emerging science. All of this intellectual progress led to the printing of lots of books – and the ones that have survived to this day can be quite valuable. The day finally arrived, and I found myself confronted with six shelves of respectable-looking books. I considered them as they stood, and I found that they continued to fuel my hopeful fantasies. The shelves were stacked with gilt-tooled leather and parchment bindings, a few were bound in alum-tawed pigskin, some disbound, a few nineteenth century sets in cloth, in all, promising books. However, as the saying goes, one should not judge a book by its cover. Or at least, not by the cover alone. Although condition, illustrations, and bindings are important, the main source of the value of a book is its content. And so I began to take the books down from their shelves. Half an hour later, I started to wonder if I was still in bed, dreaming. I couldn’t believe what I was seeing. The books were just stunning, a book person’s fantasy. The first few were books about optics and lens grinding, all illustrated with stunning engravings and woodcuts. Then I found a few about microscopes, with illustrations of the tiny worlds hitherto invisible to the human eye, visible and knowable now only because of the advent of this new technology. Then I found Hevelius’s Prodromus Astronomiae, and it stopped me cold. 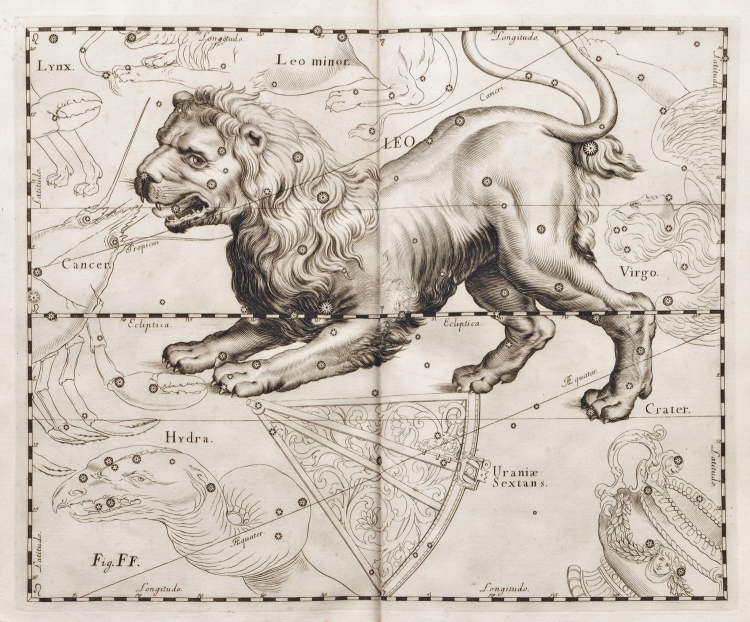 This book was the most important star atlas of its time, cataloging more than 1,500 stars, and illustrating the major constellations in arresting double-page plates. The presence of this pivotal work suddenly put the entire collection into another category. As I scanned the shelves, I noticed three Galileos, Tycho Brahe’s Works, and a first edition of Sir Isaac Newton’s Opticks. This was no longer just a pleasing collection of very good books, it emerged as a significant collection of truly exceptional books, gathered together by a New England scientist and instrument maker in the middle part of the last century. I am pleased to offer this important history of science collection in the November 18th rare book auction. After the sale they will go on to new homes, so that the next generation of book lovers can either begin, enhance, or complete their collections with these fine books. This entry was posted in Blog and tagged Auction Highlights, book auction, Books & Manuscripts, Devon Gray, fine books, Galileo, Hevelius, history of science, Isaac Newton, rare book, Tycho Brahe by Devon Eastland. Bookmark the permalink.